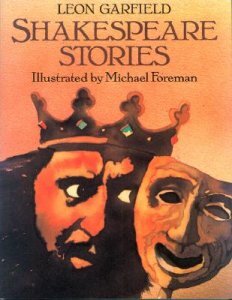 Among the authors who to adaptations of William Shakespeare’s works, so that even the youngest children could appreciate both their languages ​​and content, the one I prefer is Leon Garfield. Assuming of course that so far I had not the opportunity to read and analyze all of these authors, more for lack of time than desire, he is my favorite for different reasons. For example, for his ability of syntax, which at the same time does not neglect the narrative and lexical details of the original verses, so that reading becomes smooth and “musical”. And for the fact he does not change plots, as sometimes adapters do, choosing example for a happy ending for the Bard’s most famous tragedies, with a consequent loss in meaning, as well as in content. After purchasing the two volumes of Garfield’s Shakespeare Stories in English language, used copies and on the Internet, I started to read some chapters to my children, Daniele, age 6, and Francesca, age 4. I have always been trying, part seriously, part as a game, to involve them as much as possible in my passion for Shakespeare’s works and in the study of English language. I use then to read a few lines in English first, then to translate them into Italian. In order to simplify the narration, and to facilitate my this process, so to speak, I decided one day to start to translate the stories before reading them, to have a kind of canvas to help me lessen my “embarrassment” with my two little Masters. Hence my desire to share with my Italian mother-tongue readers some translations of Garfield’s stories, destined not only to children but also to those who want to get closer to Shakespeare, for example before enjoying the most worthy original. Translations which I share with you in all humility: a tiny drop in the world of Shakespeare, designed for those who wish to be part of this ocean. Ok, maybe I am exaggerating a bit with this Shakespearean education…. Note: considered as works which will be shared online, my translations can be copied, printed, read aloud, spread “as you like it”. All that I ask is, please contact me in advance before using my texts publicly. Thank you!